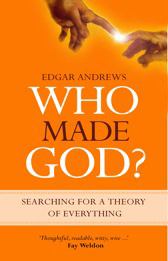 In Professor Edgar Andrews' book, Who Made God, the goal is not to refute atheistic assertions, but to develop a theory of everything (p. 10). This envelops both the material and non-material aspects of the universe. Who Made God? is repeatedly asked by Richard Dawkins in his book The God Delusion. Who made God have been the atheist’s most frequent philosophical weapon and objection to the existence of God. Professor Andrews addresses the argument that “man made God” is actually the polar opposite of what Christians assert to be true. But then the professor asks, “if we made God, who made us? (p. 17)” Scott Adams said that evolution isn’t a cause of anything, it is categorizing, and observation, and it doesn’t deal with the cause of who made us. Then you could say, “if evolution made us, who made evolution” (p. 18)? The atheist might answer, “everything around us”, to which we could ask, “who made everything? (p. 18)” This is like the circular, never ending cycle, which is what is called Tautology. Whatever A makes, say, B, then A must be greater (p. 19). Professor Andrews uses the example that Beethoven was greater than his composition. Another way to look at this “who made” circular tautological is like his wife making a cake. The cake is eaten and then gone, and ceases to exist. The wife is greater than the cake and continues to exist, thus, the wife is greater than her creation, the cake. What continues to exist and what created therefore must be greater than that which is created. Even Dawkins argued that a God who made a hugely complex universe must be more complex than His creation (p. 19). The Probability Theory is a branch of mathematics using numbers (e.g., the probability of having a coin toss land heads or tails an “x” number of times). The probability is graphed on an X-Y graph with a curve charting the probabilities of a particular sequence (p. 20). Professor Andrews has successfully debunked the Probability Theory as “nothing of the real world” (p.20). In chapter six of my own book, Blind Chance or Intelligent Design? *, I stated that chance has no power to produce an effect or be a cause. I pointed out that we could say that there is a 30% chance of rain. But the probability of the chance for rain did not actually cause it to rain or affect the atmospheric conditions to make it rain or create rain showers. The “chance” of rain is powerless against the environmental facts contributing to the causes of the precipitation. Professor Andrews clarifies this by saying that the claim that anything must happen by chance if you wait long enough, is based on the idea that “…no mathematically possible even has zero probability” (p. 20). Dawkins ignores this fact in one of his other books, Climbing Mount Improbable. He hails the astronomical probabilities as confirmation of the probable outcome. He ignores the fact that chance is a non-event, a non-material catalyst; it is a non-factor and can not be said to be a cause of anything. In the Science of Thermodynamics, its statistical probabilities of spontaneous events Dawkins uses as a causative force. He equates the statistical probabilities of spontaneous events as related mathematically, to the degree of order or complexity in the system (p. 22). Low complexity requires high entropy or randomness, while high complexity of necessarily requires low entropy or randomness. Professor Andrews uses the example of a china bowl being dropped and shattering as becoming less ordered. If you collect these shattered pieces on the floor and drop them again, will they become more complex or more ordered? No. To make the shattered bowl more ordered requires “…more directed energy input and intelligent effort; therefore, “It could never happened on its own“(p. 23). Dawkins, conversely, believes that it could, apparently, and this flies in the face of the Science of Thermodynamics. Low complexity can be served by randomness, e.g., 6 dice dropped on the floor can for a circle. High complexity “…has a negligible probability of occurring accidentally or spontaneously” (p. 23). The universe, all physical matter, “…represents a highly improbable arrange of matter and energy, an extremely improbable arrangement” (p. 23). Professor Andrews continues by saying, “The Laws of fundamental constants of nature give every appearance of being fine tuned to permit the existence of intelligence life on earth (known as the Anthropic Principle)” (p. 23). Like the china bowl being repaired is highly improbable because of its uniquely formed” (p. 24). Then, what of the statement, “God must have a cause?” We are then assuming that there is no spiritual or non-physical realm, which is impossible to prove (p. 25). Its like saying, “How long is a piece of string?” The question is which piece of string do you mean? Professor Andrews concludes in chapter one by saying, “There can be no logical answer for an illogical question” (p. 26). The question then becomes “Who created the uncreated one” (p. 26)? Albert Einstein succinctly stated that, “There are only two ways that you can live. One is as if nothing is a miracle. The other is as if everything is a miracle. I believe in the latter". Professor Andrews leads us into chapter two, which is next in this series, by an axiomatic statement: “Science can describe the fundamental structures of matter, energy, space, and time but can hardly be said to explain them”(p. 27). This is an intriguing piece on an ongoing issue, the issue of the natural rational theology vs. revealed truth examined briefly in my article on Shastov. Indeed, the enormous equivocation that most atheists make is that of taking the god of Aristotle and assuming that it is the same God of Abraham, Isaac and Jacob. That is not so. The god of Aristotle is a rational product of the human mind and as such it is ultimately an idol fashioned by man. Aristotle calls this god “the prime mover” who begins the whole show of a universe moving though space and as such he is its cause; he also thinks that his essence is that of thinking of his own elevated thoughts forever and ever; by implications what philosopher do is for him “the realm of the blessed” where they think elevated thoughts, the most elevated being the conception of god. On the other hand, as Kierkegaard, and Shastov, and Barth and Vico have taught us, the God of Abraham and Isaac and Jacob is a God who is free of the necessary constraints of rational natural laws which He/She is not free to violate; he is instead a personal God who transcends those constraints and remains free, and from Whom anything can be expected; which, as Aquinas has also well taught us, does not mean that He/She is an irrational or cultic god. Kierkegaard begins his “Fear and Trembling” with the question: is it rational for God to order the sacrificing of one’s own son? If only assorted atheists and agnostics took care of making those crucial distinctions they would begin to have some doubts about their absolute certainty that there is no God. The question “Who created God” has been answered in an article published in the online journal Scientific God Journal Volume 1, Issue 8 (http://www.scigod.com).